Tonight's cartoon celebrates the culmination of the film awards season the Oscars which if you live in the UK you can watch live from 01:30 GMT. I like films but I never saw the attraction of sitting and watching hours of people who aren't me receiving awards, although I gather it has alot to do with dresses both whose were nice and 'oh my gosh can you believe what she's wearing/not wearing'. We'll see who wins but if I were an Academy judge I'd give it either to The Kings Speech (which I haven't seen but it's British) or to The Social Network (which I haven't seen but it's Aaron Sorkin writing). As you can tell I'm a huge film fan who doesn't get to the cinema much. As well as the shocking news that dead dinosaur juice surged to almost $120 a dollar thanks to the unrest in Libya today I learned that Brotontosaurus don't really exist!! This is after me spending last summer singing a catching little song to my kids about keeping a Brontosaurus as a pet who was as big as a house. The short version is that in the late 19th century a couple of prominent paleontologists, Cope and Marsh were trying to outdo each other to see who could find the most exciting extinct animals. In 1877 Marsh found a fifty foot creature which he called a Apatosaurus. Then later that year he found a eighty foot creature which was the more famous Brontosaurus beloved of childrens songs. Trouble was Marsh was more interested in beating Cope and inventing more dinosaurs or he would have noticed (as Riggs did in 1907) that the Apatosaurus specimen was merely a younger version of the Brontosaurus. So the species were the same and so scientists decided that the first published name Apatosaurus should be the correct scientific term which didn't stop people who preferred the snappier Brontosaurus. To make matters worse it turns out the head Marsh claimed belonged to the Brontosaurus actually came from a different dinosaur leading us to wonder whether Marsh got mixed up or deliberately used a skull from another location. 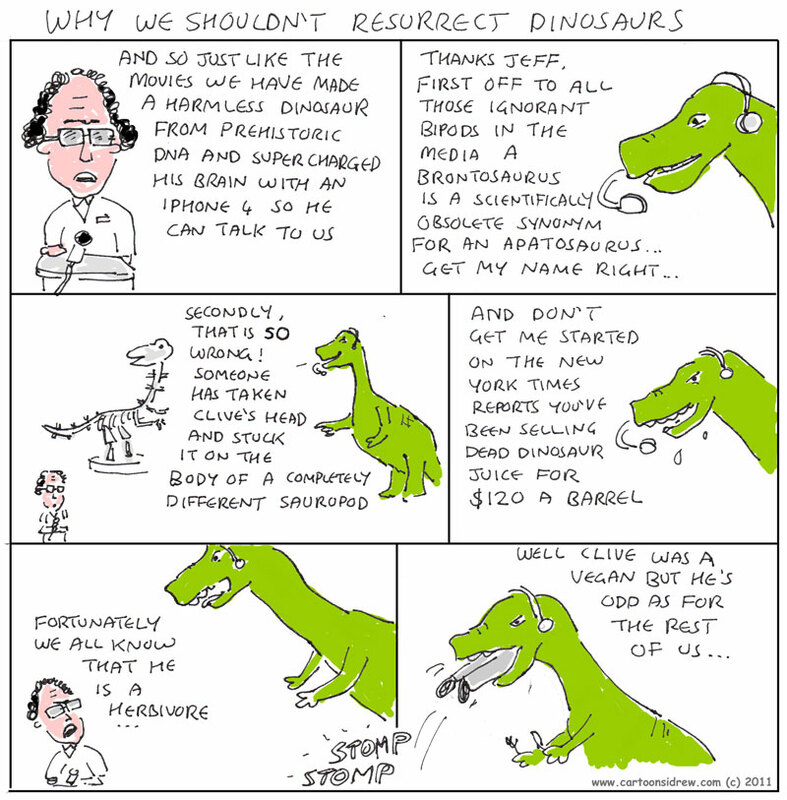 I won't paraphrased the whole article but there are other things we thought we know about Brontosaurus that were wrong too which leads onto tonights cartoon warning. Lets not dabble in recreating dinosaurs from DNA stuck in amber like Jurassic Park. After all they might be angry with us from powering our cars with dead dinosaur juice and calling them the wrong names! Tonight's cartoon is based on two competing ideas I had in the car coming home listening to Radio 4 covering the turmoil in the Libya where the mad dictator Gaddafi is waging war against his own people who are calling for a change like in Tunisia, Egypt and Bahrain. The events in the Middle East are hugely significant and who knows where they'll lead but when human life is being lost how can you say cartoon about it without sounding insensitive? Then I was also thinking about how my daughter was due a prize through my newly drawn Tangled reward chart and how a friend had posted a link to an article on Facebook 'Five Reasons to Stop Saying "Good Job"' talking about how we shouldn't always praise our kids and all the psychological damage it could do to them. ps. The homeplug line refers to my Comtrend 902s which are playing up (don't know why that would interest anyone). Are you reading this on your iPod? Do you love all your cheap apps and marvellous media? If so spare a thought for those who produce the content for your fondle slab that discovering that Apple want to take their cut (a triple tithe of 30%) at every opportunity. Software developers signing up with Apple know they will take 30% of whatever they make, music artists know that iTunes will receive a bigger slice of their download revenue than most of them with their 30% but now newspapers and subscription based services are reacting angrily to the news that Apple want them to offer subscriptions through their iOS application thus offering Apple their 30% share. In particular music and media app like Spotify and Last.fm are warning that 30% will guarantee they will make a loss on their services. 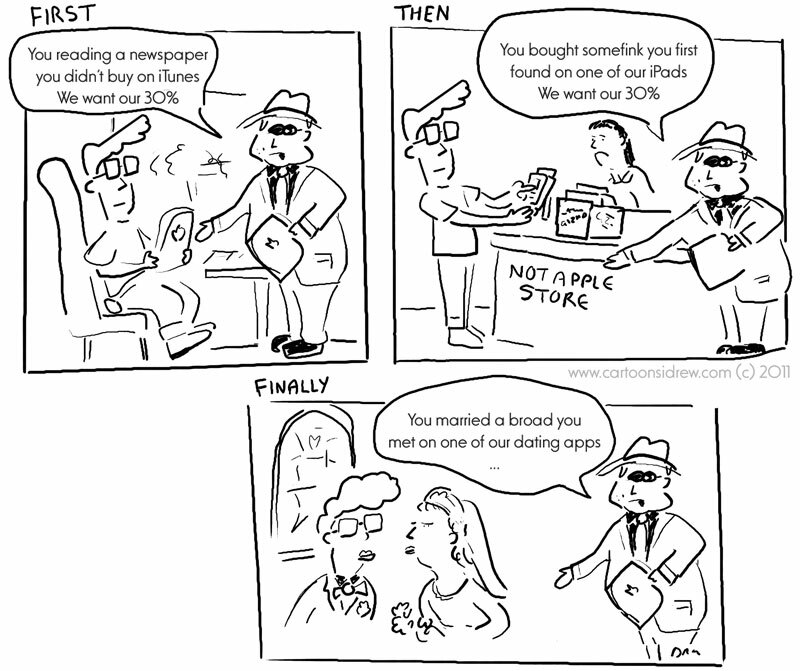 Only a market leader like Apple would risk such a strategy and even know it may backfire on them. Consumers may love their fondle slabs but if they want businesses to contribute content for it then they have to give them a compelling reason to do so before their rivals offer more lucrative terms. For those joining us on the search term tithe just remember to 'Render unto Steve Jobs the things that are Steve Jobs' (a slight paraphrase of Matthew 22:21). For those who think that giving a church 10% is bad, Facebook and Google want all your personal data and Apple merely want 30% of your lives (but maybe not your wives). There's a new Princess in town as Disney's movie Tangled hits these shores and soon Rapunzel will appear besides the traditional trinity of princesses (Cinderella, Sleeping Beauty and Snow White) on all sorts of merchandise. 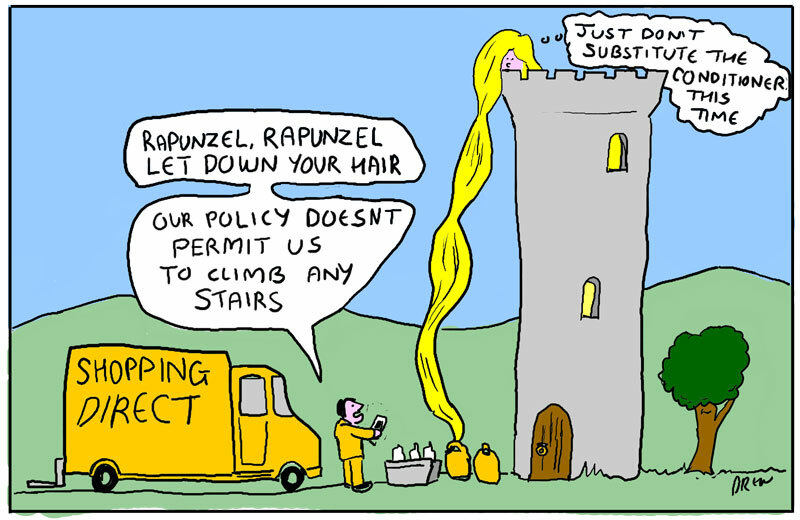 Only the womenfolk in my household saw it (until it is on DVD) and so I'm forced instead to cartoon on the difficulties of being locked in a tower with long hair and getting your groceries over the Internet. P.S. The more observant of you will have noticed the change in domain from cartoonsidrew.blogspot.com to http://www.cartoonsidrew.com/ or even cartoonsidrew.com. Apparently the sun has just woken up from a period of being a bit sleepy and a series of eruptions is currently sending waves of sunshine particles towards the earth's atmosphere. According to scientists and the media this will either knock out power grids, mobile phones and satellites or merely make some pretty lights in the sky (i.e. they don't know). My 4-year old daughters reaction on seeing a picture of the blazing sun on BBC News 24 was to shout "Ahh the big fire, save us from the big fire" which is about the level of some of the coverage. 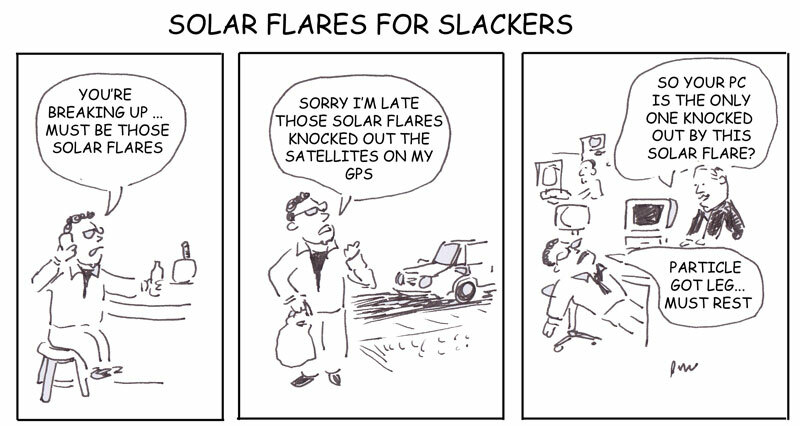 Todays cartoon depicts the opportunities this provides for people who require excuses. 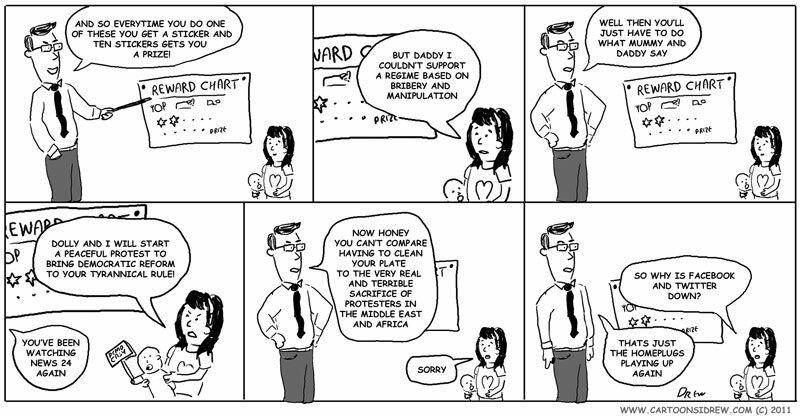 Second Valentines/Bible cartoon where we address the question of what polygamists do on Valentines Day. As often is the case I'm not that interested in the answer just the comic potential of what King Solomon who had many wives (mostly foreign) would do with his great wisdom. 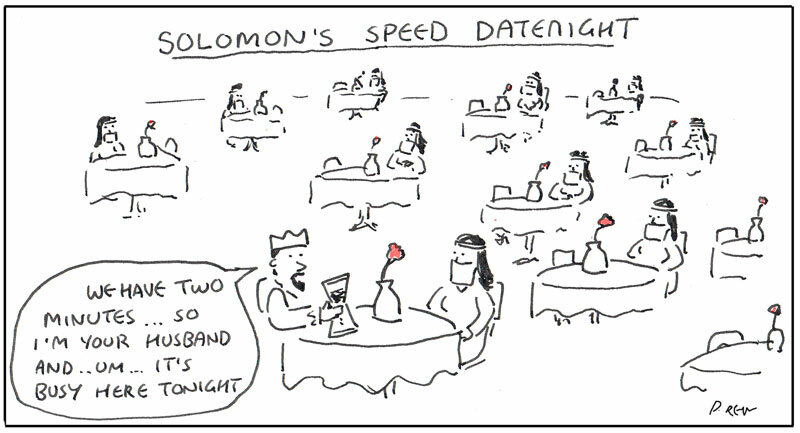 The invention of Speed Dating was credited to a Rabbi who wanted Jewish singles to meet as many new people as possible. I don't know who invented Date Night but my friends seem to think it's an American idea whenever my wife and I declare on Facebook we are abandoning our offspring to go out together for Date Night. However I'm pretty sure I invented Speed Date Night the way for polygamists to spend a bit of quality time with their many wives on occasions like Valentines night. 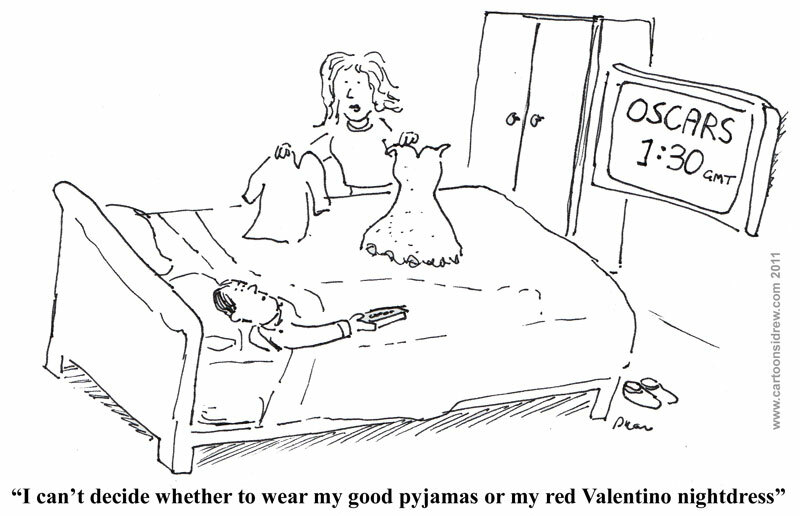 One week to go until Valentine's day and this cartoon reminds us of the perils of picking Valentines cards for your beloved from a range of pre-packaged sentiments. 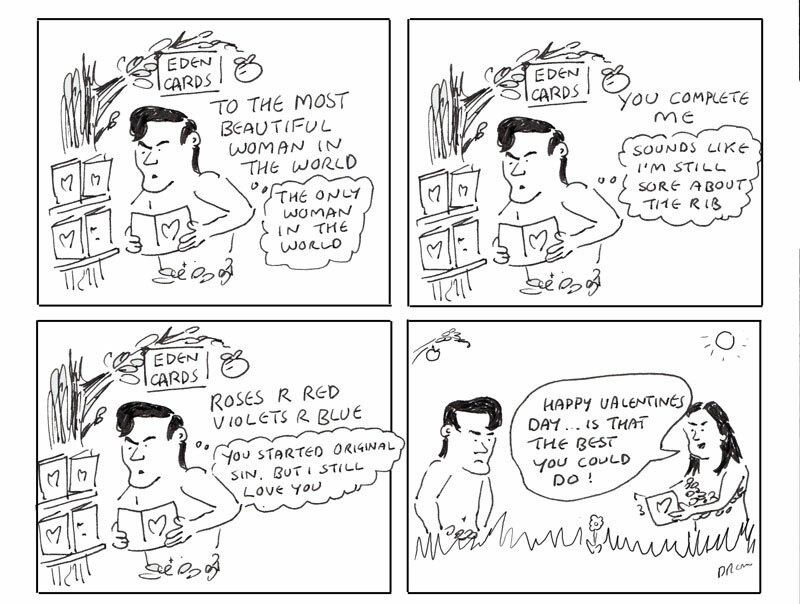 I like the idea that Adam having chosen the names of all the animals would struggle to pick a Valentines card for Eve. Today's cartoon is about hospitals after I had to return to my local one for some post-op splint removal. Hospitals can be a bit grim I wish they were more like this. On a unrelated note did you know that no-one knows where the Hokey-Cokey comes from. There are theories of course about the Blitz, Shakers, ice-cream and 17th century popular rhymes but in this modern omniscient age with Google and Wikipedia how can we not know? What is Indiana Jones doing about it? Forget tracking down the Ark of the Covenant or the Crystal Skull I think the next film should be Indiana Jones and the Hokey Cokey! !